The St. Petersburg Times, reports that Astronaut Edgar Mitchell announced. "The Earth is being visited by extraterrestrials.·? The sixth astronaut to walk on the moon told 200 people in the audience. ·We are not alone in the universe." Further the President's after Kennedy were not briefed on the situation. Filer's Research Institute and Filer's Files is proud to announce the finding of evidence and artifacts that indicate extra-terrestrial intelligent life on Mars. This announcement is not made lightly and is based on multiple images from Mars Rover Spirit's NASA/JPL images. I have discussed the announcement with John Schussler the Director of MUFON and he cautioned my enthusiasm and stated, "I can see the apparent E on the rock. However, if you look at the other areas on the rock that catch the angle of the light, it appears that the E is part of that same light angle - an artifact not a real E. This is a situation similar to the Hoagland Mars face that was just a light angle artifact. Be careful getting to a conclusion on this one too quickly. Another photo with a light angle taken only a few minutes earlier or later would confirm or deny this." We admit the symbols are difficult to see on some computer screens and need further verification. I have made numerous unsuccessful calls to JPL, and left numerous messages. However, we are working with over a dozen images taken by the Spirit Rover that show the symbols and possibly two faces taken over several minutes. When I was in Athens, Greece we saw many similar markings, and broken carvings. 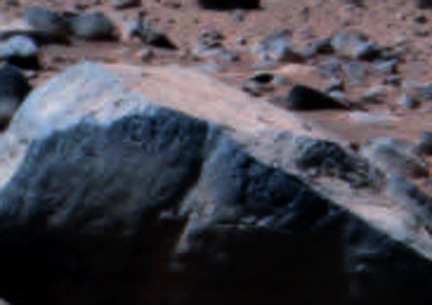 It ismy opinion that has been confirmed by several others, that there are alien symbols on the Martian rock nicknamed the "ET Rock." On the left upper corner is a symbol that appears to be similar to our capital letter E,the top of the E may be closed like a P. A second symbol similar to our letter G is also apparent. A possible face also appears to be carved in the right portion of the rock with part of a second face in the center. 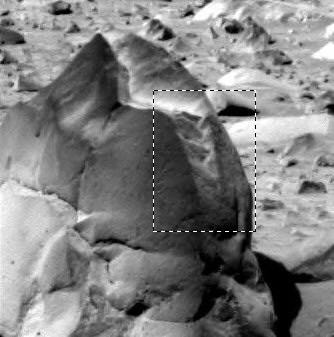 The combination of anomalous features seems to rule out natural markings on the rock. The symbols are most similar to Greek or old English writing. These anomalies are shown on both right and left panoramic cameras eliminating camera angle as a possible cause. I would caution that these are initial findings and the images have been enhanced to bring out detail. However, they can be seen on multiple JPL images taken on February 16 and 17, 2004, (sol 43 and 44). The symbols are shown in at least a dozen separate images, taken by several different cameras including panoramic left and right cameras and navigation cameras. None of the other images show symbols ruling out transmission errors, fakery, camera angle, and camera dust, etc. The impression of a face seems to appear in several sun angles and with a couple different cameras. The objects do not appear natural and suggest they have been designed by intelligent extraterrestrials. Joe writes, "Like all photos it may just be camera angle or a trick of the light, however it does look like a bird or animal skull. It can be viewed at this NASA sol photo. Actually there may be more than one face and this is speculation on my part, becaue I see eyes, lips, cheek, and chin visible. The lips seem rather wide. 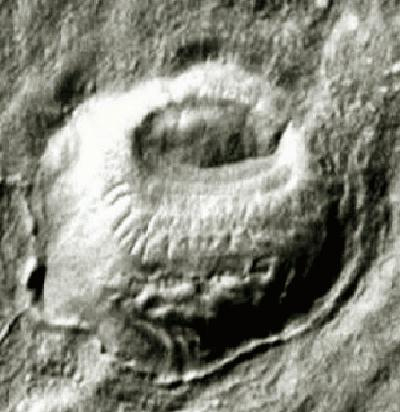 A damaged face can be seen in the center of the rock, that was likely damaged when Gusev Crater was formed. We admit these are forms that exist in the eye of the beholder, but many others besides me have commented on the face. My grand daughter Anastasia saw the faces immediately, and showed a printed picture to her class. Everyone claimed to see them. JPL may not agree with our analysis of the ET rock but in my opinion it sculptured. I have seen similar ruins in Greece, Iran, Egypt, Israel, Jordan, Saudi Arabia, and Italy. Once we realize that life exists through out the universe and is visiting us, the detection becomes much easier. You may not agree with me, but believe your own eyes. Mars Stadium - Mars stadium also appears to have writing on it that look like an A and C symbols on right and center stadium. This view was taken from a satellite overhead and shows a depression surrounded by a high structure. We know there are hundreds of planets outside our solar system and the history of the ascent of humans indicates we had outside help. It is my opinion that soon it will become apparent that extraterrestrials have been visiting and helping us for thousands of years. For example, writing developed in Egypt overnight. Water exists on Mars in large quantities in polar caps of Mars and each spring a great deal melts and appears to move toward the equator. There are two places where water is known to exist in vast quantities, right at the surface. The permanent ice cap at the North Pole is larger than Texas and 3,000 feet thick. This would provide a civilization enough water to irrigate and grow food. We now have many indications that a civilization once existed on Mars and may continue despite the dry cold landscape. The recent Spirit Rover landing on Mars seems to point to underground water due to the mud like surface. Just when we expected a startling announcement the Spirit stopped sending data. It was quiet for two weeks and just as mysteriously, started broadcasting again. Layering can be seen by ·Opportunity·? in a dry lake bed. Micro-organisms, algae and other life forms swathed in biological antifreeze could be lurking just a few feet under the ice, scientists say. These living Martians might hibernate for the winter and come out each spring. Many areas of Mars are shown to be green in the spring indicating some sort of growth. It is doubtful rocks can change color over vast areas the size of France just because of warmer weather. The water appears to move from one area to another in tube like objects that cover hundreds of miles. Life exists in harsh climates on Earth in both our Arctic and Antarctic ice sheets. A system of tubes or pipes are visible on many images that could carry water. Since we discovered strange alien writing on Mars, I have been looking for some connection to human symbols. For example, the Egyptian symbol for water is -- that look very similar to Martian tubes. Sixteen million years ago a meteorite slammed into Mars exploding with the power of a nuclear weapon and sending giant fragments of rock into space that eventually landed in Anartica about 13,000 years ago. Recently, some was examined by scientists and in August 1996, scientists from NASA surprised the world with the announcement that Mars in the distant past revealed evidence of primitive life on a Martian rock dubbed ALH 8400. The ET Rock will likely become more famous because it announces the discovery of intelligent extraterrestrial life. E and G like symbols carved into the three foot rock are significant indications of intelligent life. The three parallel lines that help make the E are unlikely in nature, the almost perfect circle of the G or O is even more unlikely. The mathematical are astronomical that these two letters could be carved by nature. Preliminary identification also makes it likely that other carvings are present. Each letter has lines emphasizing the symbols. Pictures from the rover's panoramic camera and microscopic imager reveal the target rock, dubbed "El Capitan," is thoroughly pocked with indentations about a centimeter (0.4 inch) long and one-fourth or less that wide, with apparently random orientations. This distinctive texture is familiar to geologists as the sites where crystals of salt minerals form within rocks that sit in briny water. Round particles the size of BBs are embedded in the outcrop. From shape alone, these spherules might be formed from volcanic eruptions, from lofting of molten droplets by a meteor impact, or from accumulation of minerals coming out of solution inside a porous, water-soaked rock. Our scientists at Filer Research feel these are forms algae or lichens. Dr. Annamarie Johnstone writes, ·The ·blue berries in the Opportunity Rover image may be fruticose type rock lichens (symbiotic plants composed of fungi and algae.) Forming a mutualistic relationship, the dense skin of the fungus protects the interior algal cells from desiccation, in turn, the photosynthetic algae, using sunlight, and produce food for the fungus. Lichens are brightly colored pioneer plants in an ecosystem, capable of "shutting down" metabolically, when subjected to unfavorable environmental conditions. As a result, they are able to survive extreme heat, cold and drought. Lichens grow only when moisture is available, so the amount of moisture governs their rate of growth. Fungal acids of fruticose lichens decompose rock into soil, thereby providing necessary substrate for succession plants, such as mosses; hence lichens are designated pioneer species of bare-rock habitats. Composed mainly of carbohydrates with a small percentage of protein, rock lichen species can be a food source for animals and man. The frigid community is made up mostly of primitive creatures called Cyanobacteria, which live in tightly-woven groups called microbial mats. The microbes produce chemicals that act as anti-freeze and UV shields, protecting them from frigid temperatures and from sunlight, which is known to pass relatively easily through water ice. I happen to live on a lake and most years the lake freezes but the fish and living organisms are protected by the ice which insulates the lake life against the cold temperatures that can drop to minus 60 degrees Fahrenheit on Mars. There also appears to be salts and minerals that act as antifreeze. Many photos appear to show ice over rivers and lakes. If this data ever reaches the public at large, perhaps our wars will seem less significant and we shall realize we are not alone in the universe. Interacting with alien intelligence could bring prosperity and peace to a troubled world.